Fellow BC GH'er placed an order last night, and it's already in the post office! Should arrive tomorrow! 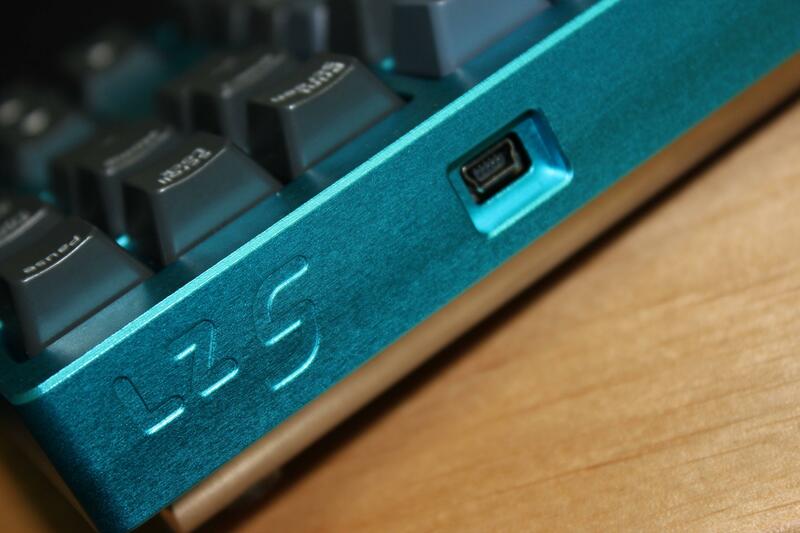 Looks great Zeal! Can't believe you're so quick! It's my goal to get everyone's order out within 1 day. To get a better representation of delivery times, I tracked two orders that were sent off during the weekend of last week. According to my tracking numbers, two US packages have been delivered today! Both were dropped off during the weekend and were processed and left Canada on Monday. One was sent via Expedited Parcel USA to NJ, while the other was sent via Tracked Packet to California. 5 Business Days for delivery. Not bad! Found an unused 1 Year Xbox Live Gold Code in my email from registering MS Office. Since I don't play any console games, the first 25 orders get entered in a draw for the code! 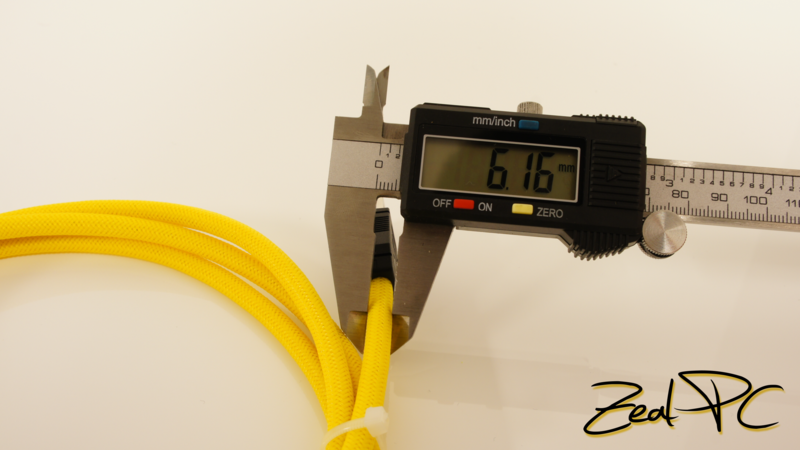 that's a lot of plastic on plastic, how flexible are your cables? The sleeves are actually quite flexible. 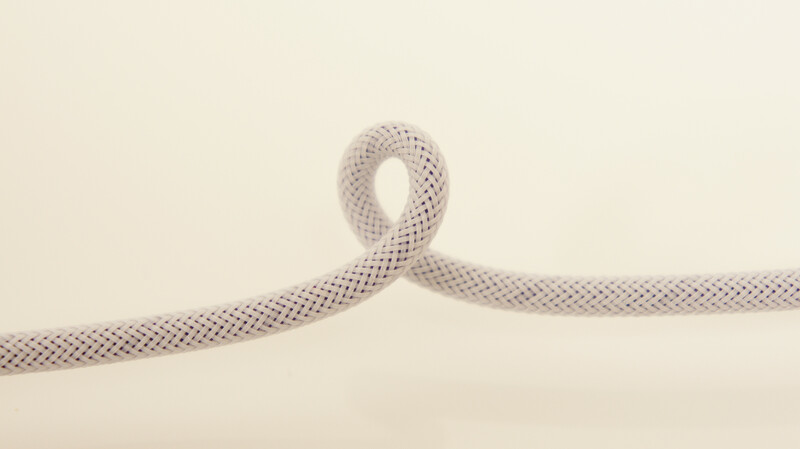 It will learn certain shapes if you keep your cable a certain way, but it straightens out if you pull it straight. The close up of those images make the sleeves/cable look really thick, but in reality, it doesn't affect the bend-ability at all! 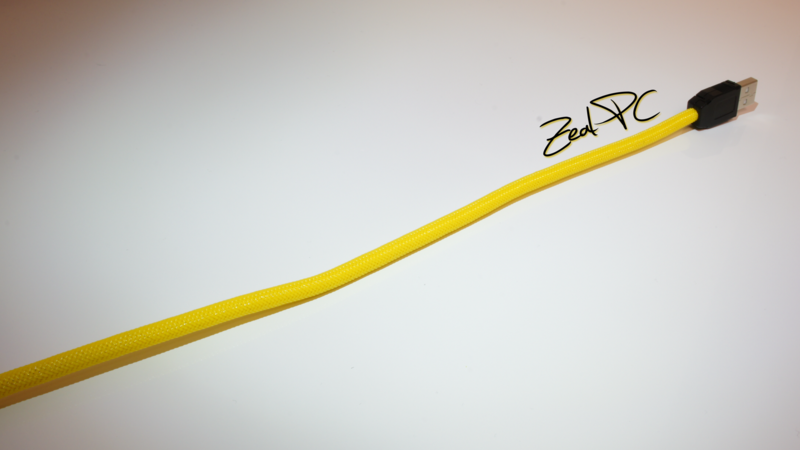 It's still much more flexible than the thicker 24 AWG wire. 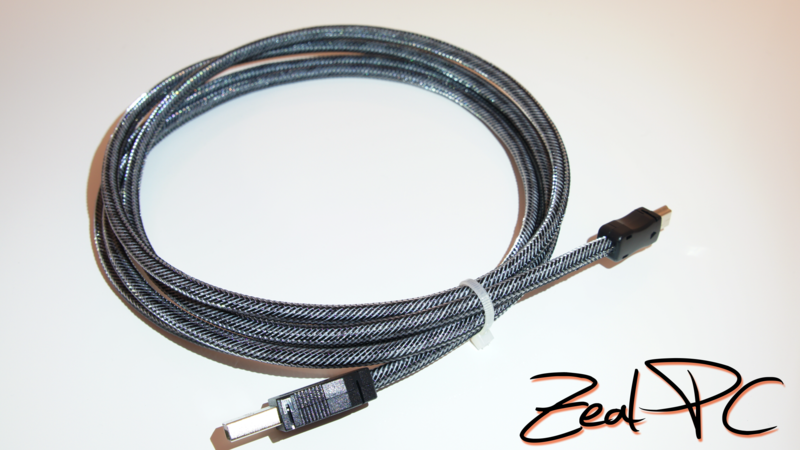 If anyone has a hard time imagining what a double sleeved cable looks like, here's "Mr. Zebra"! Currently up for sale for $22+shipping. 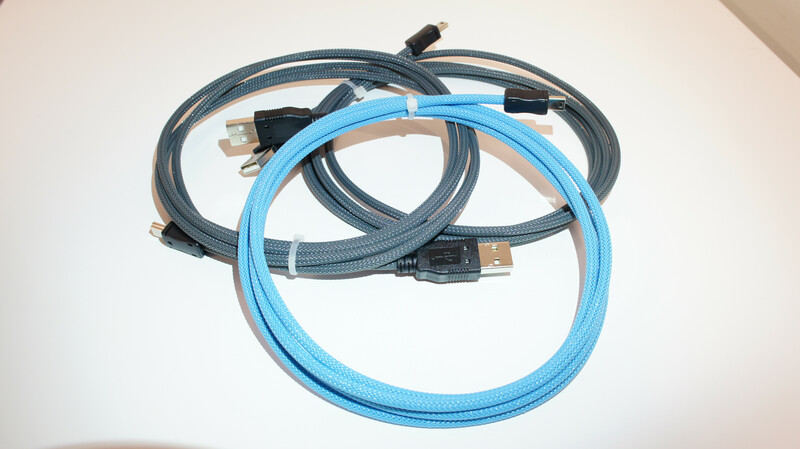 Is there interest for USB 3.0 -> Micro USB 3.0 cables? 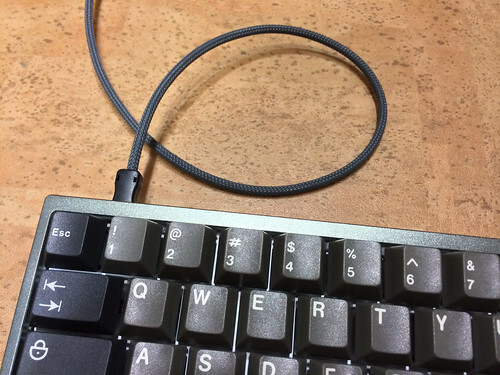 Length of cable? 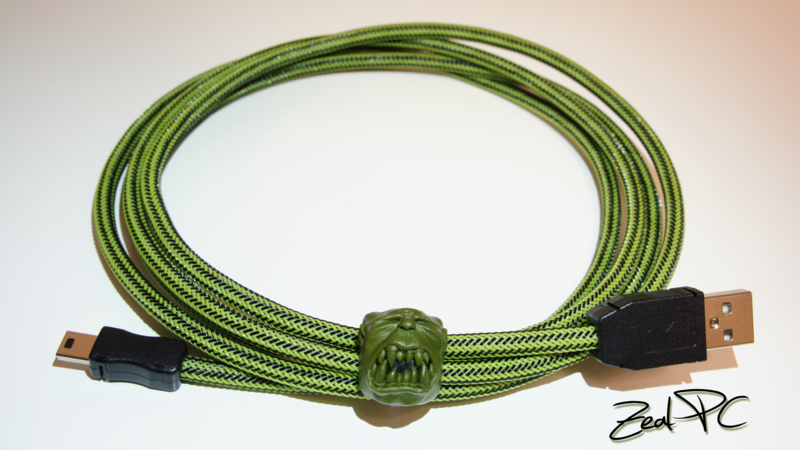 Any interest for paracord sleeves? What colours? Mostly looking at single colours for now/colours that are unavailable for plastic sleeves. Might look into two-tone sleeves if there is demand. Feedback is appreciated! 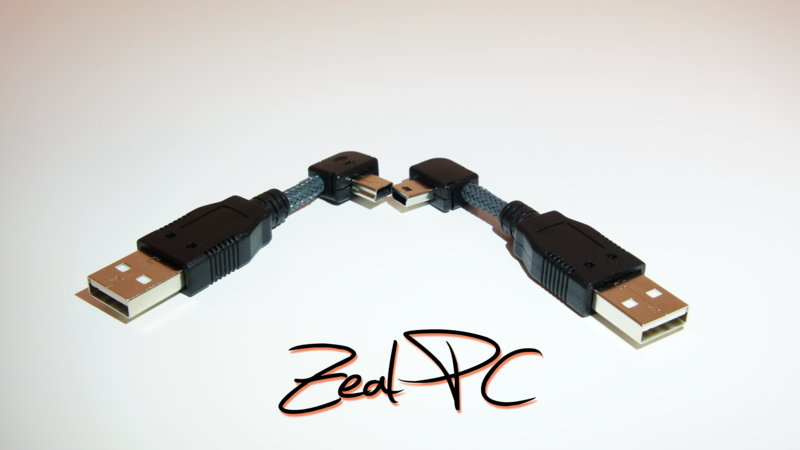 Currently have one user that's interested in paracord+usb3.0. I'd like to also hear other people's thoughts! Thanks in advance. 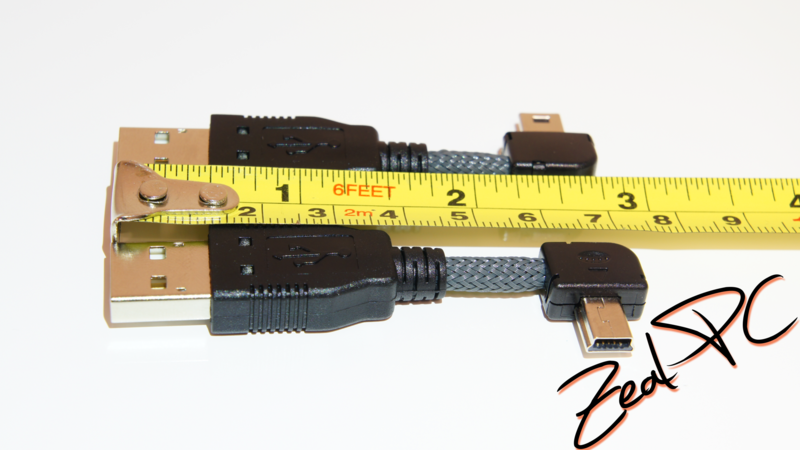 Just to note, paracord is too small in diameter for any usb 3.0 raw cable I've found. 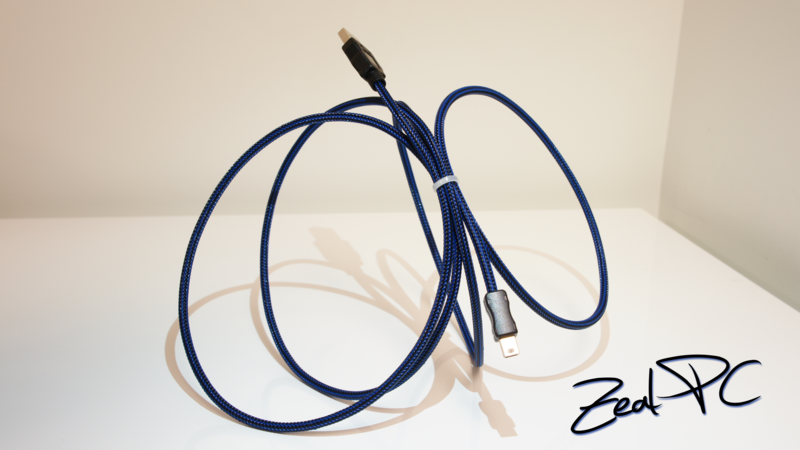 You might be able to do like whisker and modify a premade cable though. Thanks for the heads up! Will keep that in mind. According to my tracking, Mark0331 and junkimchi's orders have both been delivered today. Enjoy! Meanwhile, I received mail for right angle mini usb connectors. 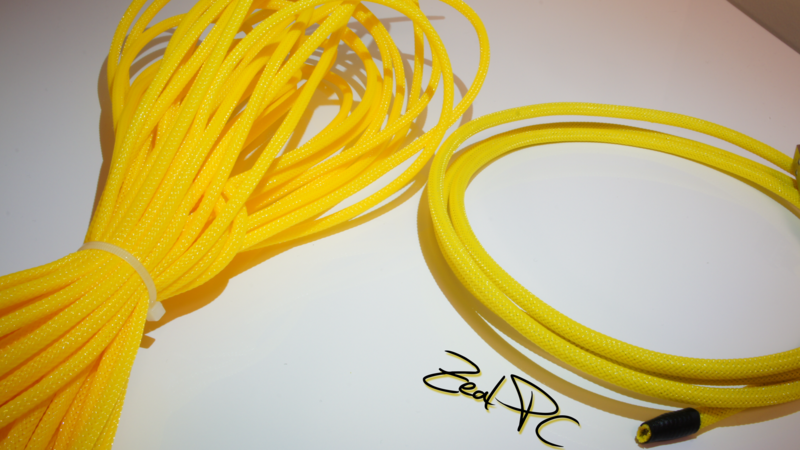 Will be making a cable today with them later in the afternoon! Depends on the orientation of your keyboard's mini usb port. Some have it upside down, while others have it right side up. For the way I want to route my cable and the position of my USB plug I need the left angled, I may just bought one of those adapters available at ebay. My connector is "Left angled". If your usb port is upside down like the second picture, you'd want to look for a "Right angled" connector. I've only been able to find adapters, but no standalone connectors that are right angled. Ops, got the wrong pic. This is it. Mr. SpAmRaY had quite an interesting order... just finished making it. Will post pics of the order tomorrow morning! Yeah it is, just a different shape. Just want to show the right picture. The formers were micro USB. Anyways, here's SpAmRaY's order! Tiniest cable I have ever made! The adapters come in pairs left and right for like $5. SpAmRaY and LemSkee's order have both been dropped off at the post office! Nearly missed the cut-off time for mail today! The clerk literally scanned the two packages and handed it off to the Canada Post pickup guy. In my defense, he was 10 minutes early! 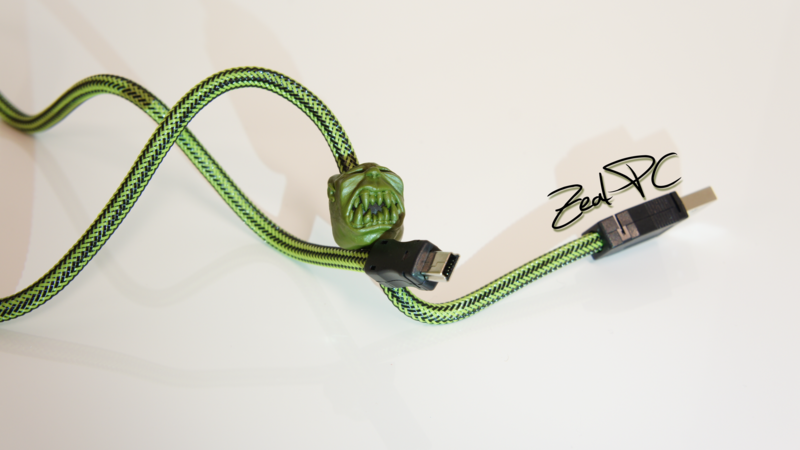 The cables looks great Zeal. Great job! sooo geeked - thx for getting them done so quickly! - wait, whatever comes after "quickly" - that's what you just did! :thumb: Was wondering when you'd pick up your package! you know...that looks pretty damn good. 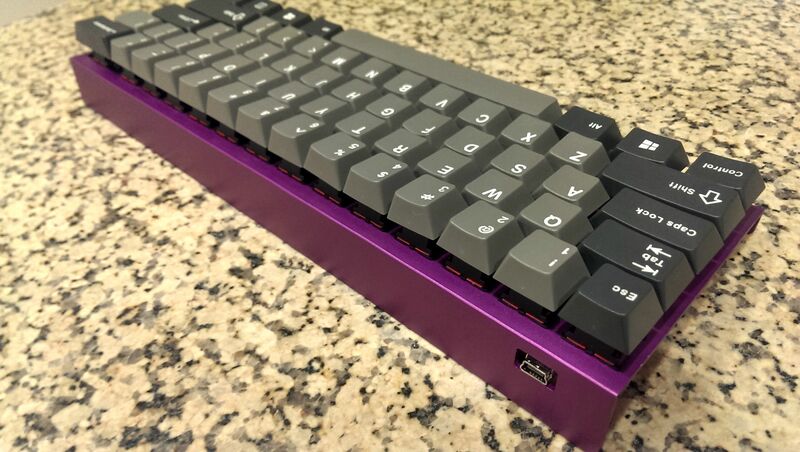 maybe having the connector casing match the keycaps and the sleeving match the case will become a thing. Pulled the sleeves _EXTREMELY_ taut to create a stiff cable that holds its bends! Pull the cable straight, and it'll be as straight as a stick! 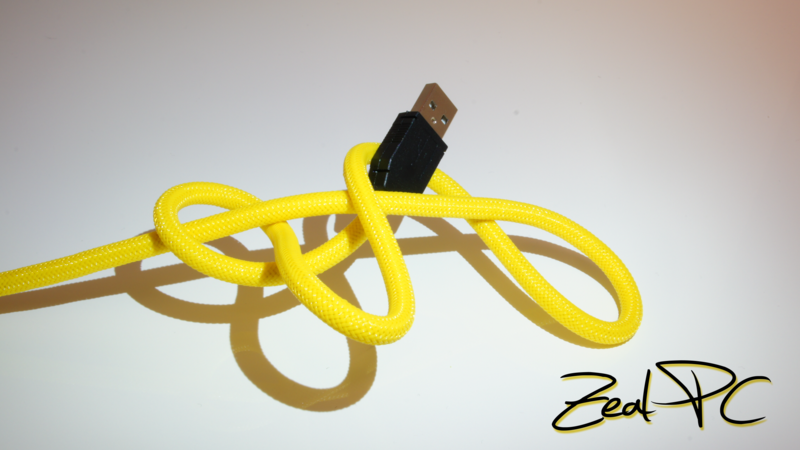 haha Cable bends well, but doesn't like being twisted. DO YOU EVEN RIDE ROLLER COASTER CABLES, GUMROT?! 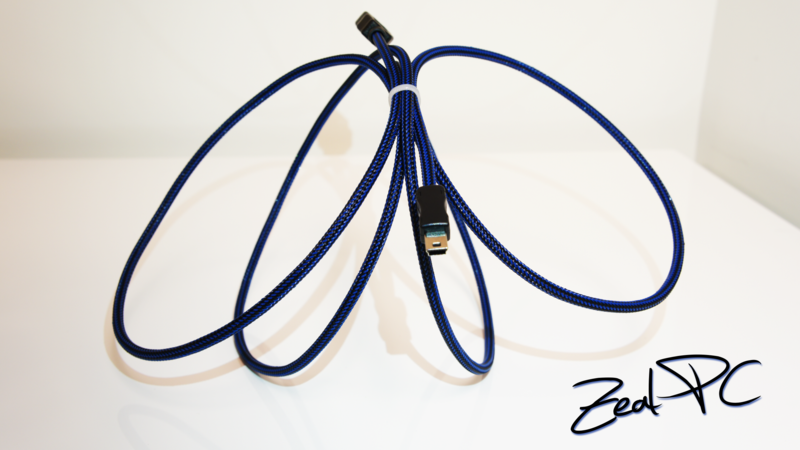 $20 - 6ft Navy Blue/Black Mini USB. Yes, I was bored enough to balance the cable on two "legs". Most "accurate" blue I could capture. I have a hard time taking accurate pictures of blue cables when I'm shining light on the subject. Tried to tone down the blue in this picture, but it's still a bit too vibrant. Maybe I should get a cable. Now I HAVE to order. I look forward to making you a cable! I've created a monster...a 5 foot BANANA!!! Unsatisfied, I ventured a bit further... TO A TRIPLE SLEEVED USB CABLE!!! YELLOW ON YELLOW ON WHITE. BUT BENDS ARE STILL SOFT AND FLEXIBLE! 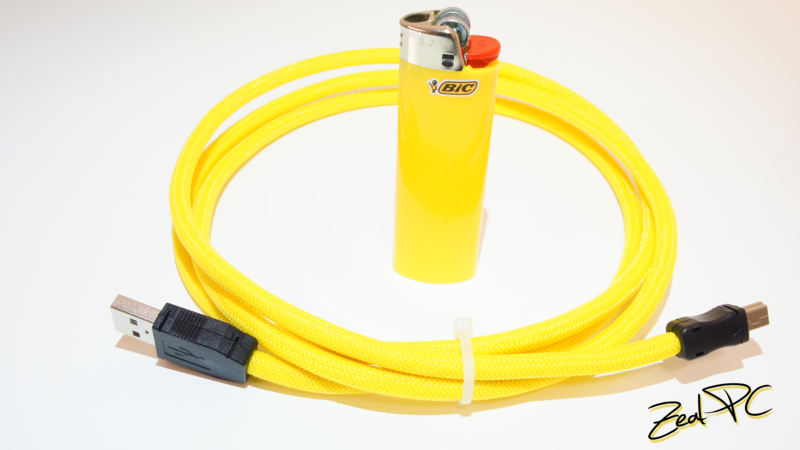 IT'S SO YELLOW, IT'S AS YELLOW AS A YELLOW BIC LIGHTER! 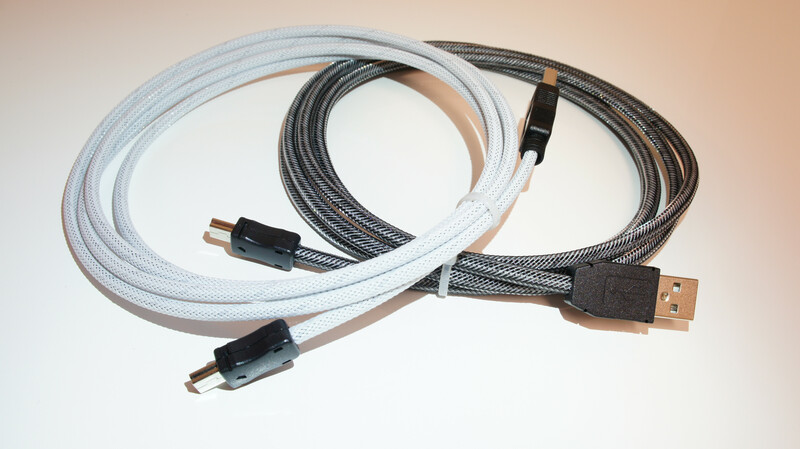 Triple sleeved, 5ft Mini USB Cable for sale for $25. 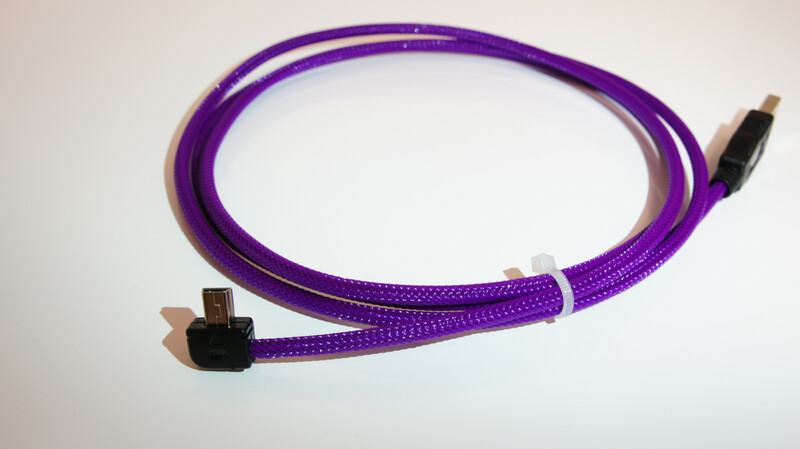 I keep meaning to order one of these, and then other things come up that I can't put off, and thus, ordering a new cable has to be put on the backburner. Eventually you will have some of my business. 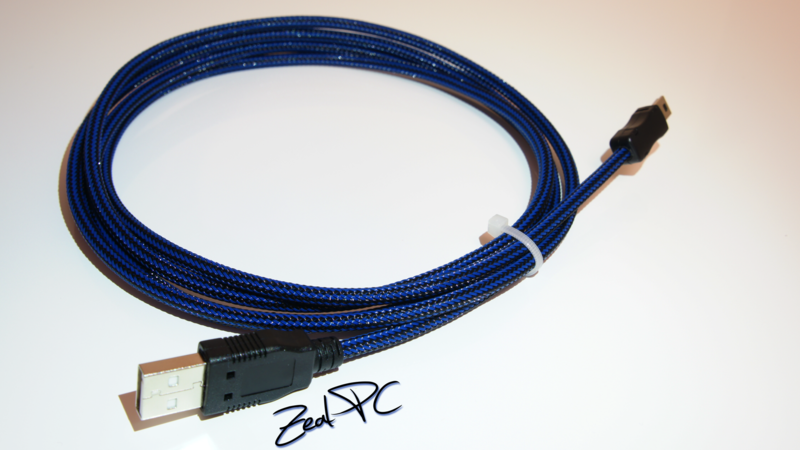 Consider this my compliments on some great looking cables. Thanks for the compliment. 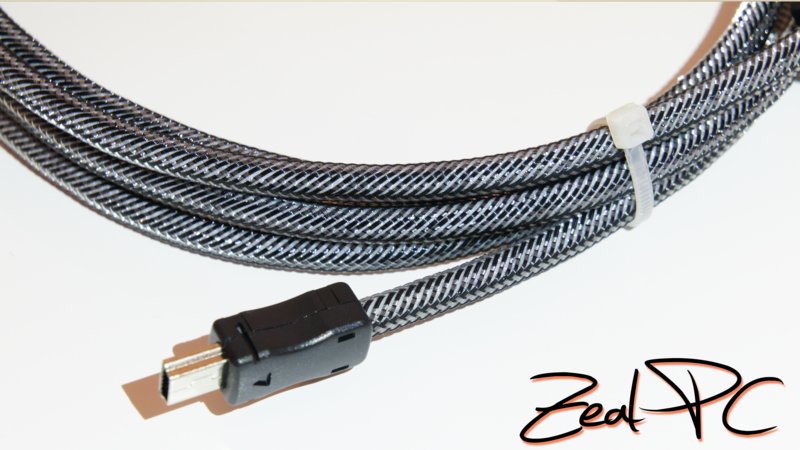 Look forward to making your cable(s)! I have some stuff that's coming in about a week that I'd like to test for science...but I have no clue if it'll work or not! If everything works out, I'll only have 6 of these mystery items for sale! Just got some 90° Micro USB connectors in the mail! Seems like it will work for both left and right angle! Can only fit 28AWG wire though! Holy ****! I was so afraid that the tiny bubble mailer would get lost without tracking, or the plastic labelope would rip open while sorting! The packaging was awesome!! Thanks so much for these!! Using fragile stickers as tape to wrap your cables in the bubble wrap! The package was mailed out and entered the sorting facility on March 5th, and arrived on the 10th. I guess they really meant 4 business days when the estimated shipping time was 4-10 business days! Why does it feel like mail that doesn't have tracking gets delivered faster? Page created in 0.148 seconds with 82 queries.